Developing iOS apps in Xcode is pretty great. With Objective-C and llvm we get type checking and autocompletion of all our classes and method names which is a nice improvement over my favorite dynamic languages. Unfortunately there are still some places where the compiler can’t help us. There are various resources we load from files like images, nibs & xibs and other resources which we need to specify by name, like a view controller we want to load from a storyboard. 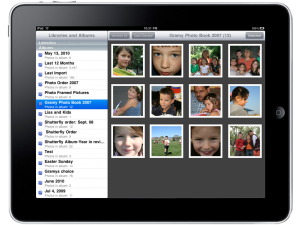 Announcing PhotoGrab for iPad! I wrote this little utility app that allows you to browse your iPhoto library shares across your wifi network and download and save either a hi-res version of your photos or a version resized especially for display on iPad. It features multi-download as well as a slideshow mode. 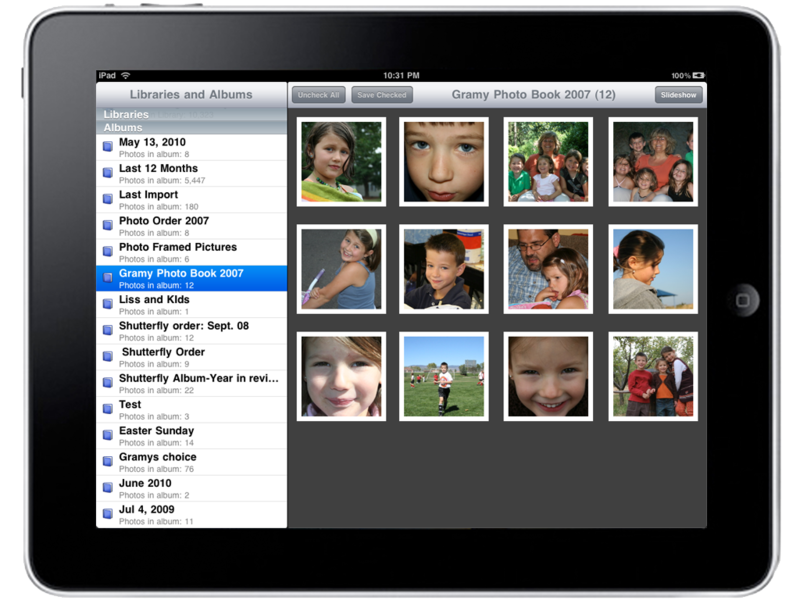 Just share your photos from within your iPhoto preferences sharing tab and you will be able to access your photos across the network from your iPad. I wrote the app because I don’t sync my iPad with the computer where we store all of our photos, but from time to time I like to grab a photo from the iPhoto library without having to sync. I just submitted a new point release that fixes a few crashers and other bugs to the App Store, but go ahead and take a look at this one and let me know what you think. Just for the readers of this site! If you’re interested in the app, send an email to promocodes at cimgf dot com with the subject line PhotoGrab Promo Codes. I will send an email containing a promo code to the first 50 I receive (since the Apple only issues 50 of them per version). Be patient with me as I will be responding manually as I receive the messages. It will be first come, first served. Otherwise, check it out in the App Store. Promo codes are only valid in the US App Store. I have received a lot of email requests for promo codes and will be sending them to the first 50 by the end of the day today (06/23/2010). If you do not receive a code by the end of the day, you were not in the first batch. When the next release hits the App Store, I will have another 50 at my disposal and will send those to the next group. Thanks for your interest. The default implementation of the UISplitViewController based template in Xcode does not provide a navigation controller stack in the detail view. Instead it is just a regular old view with a navigation bar at the top. I suppose there are cases when you might want such an implementation, however, i think you would more commonly want there to be a navigation stack for cases when you wan to push new view controllers for your users to see. In this post i intend to demonstrate how to convert the default template to something more useable. It’s not. The Real Work is not formatting the margins, installing the printer driver, uploading the document, finishing the PowerPoint slides, running the software update or reinstalling the OS. The Real Work is teaching the child, healing the patient, selling the house, logging the road defects, fixing the car at the roadside, capturing the table’s order, designing the house and organizing the party. Exactly! The iPad is genius and it will revolutionize not just books, magazines, etc., but it will revolutionize computing as we know it. I don’t know about you, but I’ve got the new SDK fired up and ready to start rocking some apps and it is a very exciting new platform!